When you define your own routed event in a class, you raise the event using the UIElement.RaiseEvent method. The RaiseEvent method accepts an instance of a RoutedEventArgs object. Notice that this is same class type passed to event handlers that are declared using the RoutedEventHandler delegate type. When firing a routed event, you can choose to use one of the subclasses of RoutedEventArgs, if you have additional information to pass back. 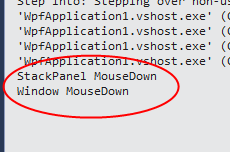 For example, you might declare your event to be of type MouseEventHandler and then pass back an instance of MouseEventArgs when raising the event. 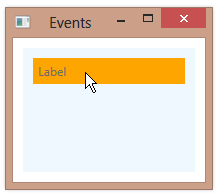 You can create a new routed event in your own class, typically in a control. Here, we define a new event named RightDrag in the MyButton class, which derives from Button. Define a static object of type RoutedEvent. In the static constructor, register the event and set the RoutedEvent object. Define a CLR event of type RoutedEventHandler or one of its subtypes. Call the AddHandler/RemoveHandler methods. Add a helper method to fire the event. Finally, fire your event when appropriate.